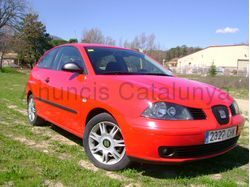 SEAT EIVISSA 1.4 16V SPORT. 2003, 138000KMS, IMPECABLE ESTAT I PERFECTE FUNCIONAMENT. ITV FINS NOV 2011, RADIO CD + CAIXA 6CD, MANS LLIURES PARROT CK.